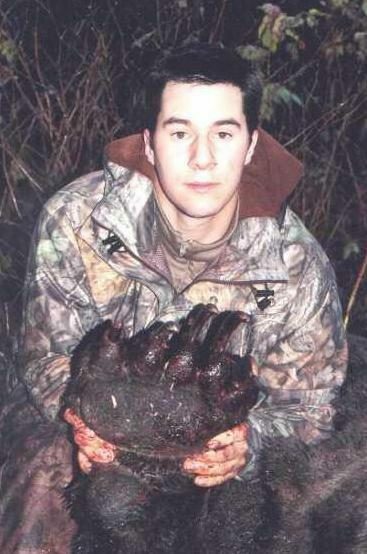 Photographs allegedly show an enormous bear killed by an Alaskan hunter back in 2001. 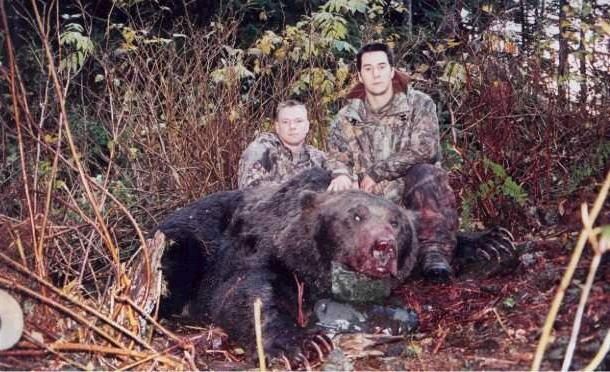 Photographs show an enormous bear killed by an Alaskan hunter. How would you like for this monster to walk up on you in the woods? Check out the size of the paw in relation to the guy’s head!!! This bear was killed down on Hitchenbrook Island by an airman stationed at Elmendorf. The bear measured 12′ 6″ and was estimated at over 1600lbs. The guy was walking to his hunting area and the bear stood up only 35 yards away. The bear dropped down and went straight for him. He emptied his gun and the bear fell 10 yards from him. The photographs displayed above are authentic, and the basic story of their origins are correct, but, predictably, some of the details have been altered or exaggerated as the pictures have traveled around the Internet. Winnen and three hunting buddies were dropped off on Hinchinbrook Island in the heart of Prince William Sound by an air taxi on a cool, rainy Oct. 14 morning. Hinchinbrook is a 165-square-mile island near Cordova with an estimated population of about 100 brown bears, giving it the distinction of harboring the highest density of bears of any island in the Sound, according to Dave Crowley, Cordova area wildlife biologist for the Alaska Department of Fish and Game. Four to six bears are killed by hunters on the island every year, though rarely one of more than 400 pounds. Winnen wasn’t there to hunt bear. Instead, he and his hunting buddies packed for a week of hunting for Sitka blacktail deer on the remote, wooded island. Winnen did, however, pick up a permit to shoot a bear just in case. On day two of the group’s hunt, the skies cleared at 8:30 a.m. Winnen and Eielson Staff Sgt. Jim Urban set out to follow a creek bed upstream looking for deer. Urban was carrying a .300-caliber Winchester Magnum. Winnen was carrying his significantly more powerful .338-caliber Winchester Magnum in case a bear crossed their path. In the creek, they spotted a deep pool with 20 salmon circling. The two men continued following the creek upstream until they came to a small island ringed with thick brush. Some end-of-season blueberries clung to the surrounding brush. In the middle of the island was a spruce tree larger than what Winnen could fit his arms around. At the base of the tree were signs that an animal had tried to dig a hole. About 9:30 a.m., Winnen glanced upstream. Forty yards away was a big brown bear with all four paws in the creek, flipping over logs looking for salmon. “He’s a shooter,” Urban said under his breath. The hunters moved a few feet upstream. About halfway between them and the bear was a large fallen tree. “I said, ‘When the bear crawls over that log, he will present his vital areas and we’ll take him,'” Winnen recalled. “I brought the rifle up to take a shot, but the bear moved over the log like it wasn’t there. As the bear kept coming along the creek, the two hunters momentarily lost sight of him in a thicket, so they retreated back to the big spruce. “I put the scope on him. I wanted to hit him in the chest, but all I seen was nothing but head. “My partner said, ‘Shoot! Shoot! '” Winnen said. “I aimed for his left eye, but the bullet takes an arc and I hit about two inches low in the side of his muzzle and into his brain. “It was amazing when I got close to him,” Winnen said. After the kill, Winnen and Urban spent six hours skinning the bear — and trying to drag its hide and skull back to the Forest Service cabin they had rented. Ted Winnen, who shot the bear, was an airman with the U.S. Air Force, not a Forest Service employee. The bear was large, but not a “world record 12 feet 6 inches high at the shoulder” and weighing “over one thousand six hundred pounds.” The ursine bagged by Mr. Winnen measured 10 feet, 6 inches from nose to tail and its weight was estimated at between 1,000 to 1,200 pounds — an extraordinarily large bear for the Prince William Sound area (about double the average size), but not a world record. The bear was coming towards Winnen and his hunting partner from about 10 yards away, but nobody knows for sure whether it was “charging them.” According to the two hunters, the bear may not even have been aware of their presence. 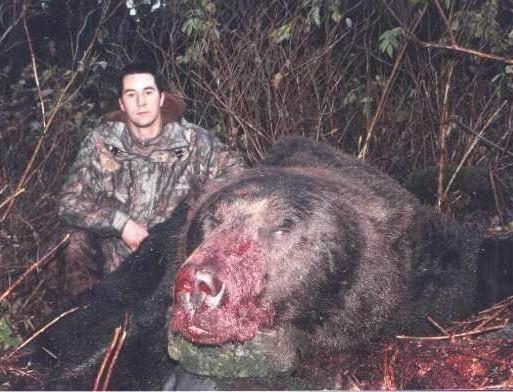 Although this is presumably a genuine photograph of human remains gnawed by one or more animals, it has nothing to do with the bear pictured above. This photograph comes from a completely different source and was only tacked on as an addendum to the bear story after both had been circulating independently for over a year. The bear shot by Ted Winnen was not known to have killed any humans. Anchorage Daily News. 16 December 2001. Anchorage Daily News. 7 May 2003.